Which type and colour of granite that was used historically will have been determined by the economics in almost all cases. They were materials used for their functionality, it is just our good fortune that they often look very fine even, or perhaps especially, after many years of use. Since there are no sources of hard rock near London, the major determining factor in the cost was transport. Long ago, the only practical volume transport available was by sea so granite quarries by the sea were obvious potential sources and it is worth bearing in mind that the cost of the actual sailing will not have been overwhelmingly important against the cost of loading and discharging. Thus, we find the earliest source quarries to be in the Channel Islands, Cornwall, Ireland, North Wales, Aberdeen and, sometimes, Sweden. Most of the initial use in London was close to the river Thames in docklands where one finds the first examples being some very large units, rather less than perfectly formed, followed by smaller and more accurate setts as production quality improved. The modern transport age started with canal building, followed by railways, then roads. The first of these used the economics of water transport but lasted for quite a short period of time before the speed and general effectiveness of rail transport became the dominant method of transport for a century. In terms of quantity, there was relatively little sourcing that was changed by the canals whereas myriads of railway lines found their way to anywhere from which traffic could be gleaned and equally delivered as close as possible to the customer, the road transport thereafter being by horse and cart. There were many independent railway companies until 1923 when most were amalgamated into four operations. These independent companies crossed and criss-crossed each others tracks throughout London in most confusing fashion. Most of them formed liaisons with others in order to compete effectively and many of these liaisons formed the basis for the four groupings in 1923. The railways brought new sources efficiently to London, in particular granite from Leicestershire and nearby. These were transported by The Midland Railway which was closely allied to the London, Tilbury and Southend. Leicestershire granites are often a rich pink to red colour and are very clearly obvious in the old goods yards of these two companies. The Great Eastern Railway, however, was allied with the Great Northern Railway, likely to be using a dark granite from the North of England. The Great Western Railway stretched to Devon and Cornwall where, especially from Cornwall, come the familiar very light silver grey setts. The London & North Western, as its name implies connected London to the North west and thence to Scotland. Most of its sources are darker greys and blacks – often basalts rather than granites. Some quarries lend themselves to producing larger elements, this being down to the nature of the particular granites. When other things have become somewhat equalised, this factor is relevant. The granites from the Channel Islands continued to be transported by sea, still highly competitive. 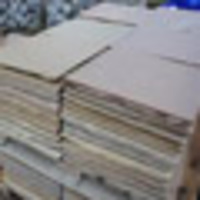 They are mostly a light pinkish grey, of very good quality and quite routinely available today as reclaimed material. Cornish granite kerbs are very evident by their silver grey colour and their large crystals. Kerbs also came from Leicestershire, though not so frequently and were almost red in colour. Setts from the Midlands, however, are very common in London especially North of the river and to the East. However, the granite did not split as easily so the standard size was a 5 inch cube of rather poor sizing, but fine quality 4 inch cubes can be found. Other sources of fine quality 4 inch cubes would have been valued. Mostly these tend to be black. One of the reasons that London streets were covered in tarmac after the war was because this very fine-grained material becomes slippery when worn and all “granites” were tarred with the same brush. However, there are a great many quiet streets and beautiful mews courtyards that have retained their heritage. It is possible to determine the source of any granite sett or kerb from the specific groupings of minerals and how they are related to each other. Every granite quarry is different. One just needs the knowledge of all the granite sources, which is a bit of a challenge but many are, indeed, known. After the war, the use of granite setts and kerbs fell away almost completely until it was realised that granite lasts so much longer than concrete and that it is cost effective in the long term. Initially this led to the much increased use of granite kerb, initially sourced mostly from Portugal but in the last twenty years from China. 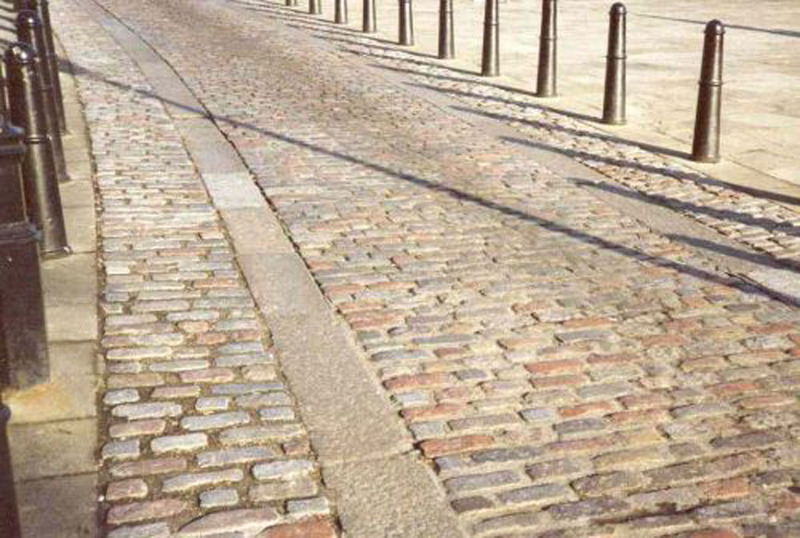 Setts were mostly used for details, division strips and the like until it was realised that shared surfaces could be a highly effective way of returning streets to people while maintaining necessary access for vehicles. 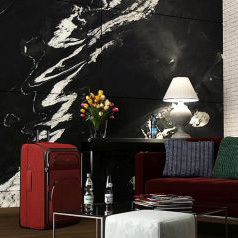 Granite is ideal for this purpose and its use, first from France thence mostly from China, has grown rapidly. The economics of European production are no longer so very much worse than Chinese so the benefits of speed and easy replacements come into force. Equally, there is now some British production once again.